Shell is the form of sea soul. It is believed that shell is originated from sea. Shell is considered a brother of goddess Lakshmi. It is believed that goddess Lakshmi stays where shell is located. It is auspicious to blow it on good work. Shell can be used in worship in the home. It can be established on Diwali, Holi, Mahashivaratri, Navratri, Ravi-Pushy and Guru-Pushy. The voice of shell is important. It refines the environment. It removes the germs from an environment. The risk of heart disease and lungs can be reduced by blowing shell. It is beneficial for speech problem. There are several types of shell. There is different type of worship. 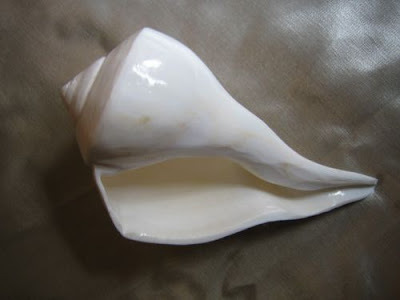 There are mainly three types of shell, Dakshnivarti shell, Madhyavarti shell and Vamavarti shell. Lord Vishnu’s shell is Dakshnivarti and goddess Lakshmi’s shell is Vamavarti. It is believed that one cannot get shortage of money by keeping Vamavarti shell in the home. There are also Mahalakshmi shell, Moti shell and Ganesha shell. Take white color shell. Clean it with Gangajal and milk. Cover it with pink color cloth and put it in worship place. Blow it three times after worshiping in morning-evening. Wash it and keep it at same place. Keep shell in cloth or cover it with cloth. Blow it in the morning and evening. Do not blow it every time. Wash it after blowing it. Do not give your shell to any other. Also, do not use others shell. Keep water in shell and take bath from it. You can also keep shell in bucket. Keep shell near your headache while sleeping. It gives relief in mental disorders. Good Luck: Do not use shell in lord Shiva worship. You won’t get benefit from your worship.